In the British Isles, "The Antipodes" is sometimes used to refer to Australia and New Zealand. For any location, the term refers to lands and peoples located on the opposite side of the world to the speaker. Under the geographical definition, the antipodes of the British Isles are in the Pacific Ocean, south of New Zealand. The antipodes of Australia are in the North Atlantic Ocean, while parts of Spain, Portugal, and Morocco are antipodal to New Zealand. To find the antipodeal location for any point, see Antipodes Map. A great distance separates Wellington, New Zealand and Sydney Australia. Quick, how far? (Answer at bottom of post.) Still, the two countries are united historically and culturally. Here's a showcase of some delightful Aussie and Kiwi design. A symbol of fertility and feminine arts. Handmade in resin, in your choice of 20 colours, by Too Luscious, medium size, 16cm x 4cm is $NZ 90 or about $US 46. Order from Aotearoa. 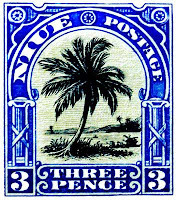 White T-shirt with stamp of Niue palm. (Niue, just east of Tonga, is an island under New Zealand's care.) $US 18 from Going Postal T-Shirts. Also available as tank or hoodie. 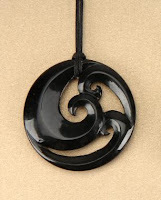 "Triple Koru", from New Zealand Nature, $NZ 99 (about $US 50). Pounamu is the Maori name for several types of hard, durable and prized nephrite jade. Tasmanian Leatherwood Honey The family is crazy about Leatherwood honey; the metal can makes a charming keepsake. $US 12.50 (750g) to $US 55 (4kg) from The Tasmanian Honey Company, or from fine food shops. I've posted on these before, but I simply can't leave them out. The best all-purpose functional boot, available in various colours and finishes, about $US 150 from The Australian Boot Company or other online shoe stores. If you enjoy the calming, traditional craft of cross-stitch, Merrett's designs, like this Eucaluptus with Wren pillow cushion, promise an elegant project. The design is $AU 12 ($US 7.60) from Stewart Merrett Cross Stitch & Tapestry. 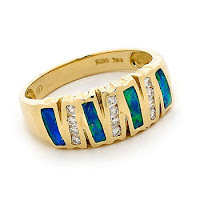 Diamond and Opal Ring Australian opal inlay and diamonds in 14k setting, $AUS 1, 320 ($US 837) from Opals Australia. Lots of diamonds come from Australia! I love your editing. Always inspiring. And I'd love some Blundstones. Every year I send Red Cross parcels of clothes, either designed and made by myself or items that I buy, to 50 something friends over there who are crying out for elegant, well made fashionable clothing. These are the same friends who come to see me in the UK every 4 to 5 years and buy at least 12 pairs of shoes whilst over here. Sorry, by 'here' I mean the UK. All I know is that the flight is at around 4 hours! Greying Pixie - I'm horrified at your parochialism - when did you last come to Australia and see some of the great design that is here? In the past 15 years so much gorgeous design has come to the surface. I think your friends are not looking for it. There is plenty out here. Duchesse - I grew up on leatherwood honey yum! Imogen: I just ordered more honey, must have it! I have found treasures all over the world, from tiny hamlets in the wilds of Canada to world capitols. Fine artisans are everywhere, if you look. Wendy: Australia produces a lot of diamonds, by carat, but not by value, as the majority are industrial. Imogen - the last time I was in Aus was in 2005 and my friends are all working in the media and/or arts and are therefore very open to new ideas. In 2005 I was invited to give a paper at a conference at the RMIT in Melbourne. There were speakers from all over the world there lecturing on various areas of design and the Australian audience was very receptive. Don't get me wrong, I know there are pockets of amazing design research, etc., but by and large ... For me Blundstones and Ugg boots say it all - form does not have to follow function. My most favourite thing to come out of Australia - Possum yarns. Warm, soft and cheaper than cashmere - highly underrated in my opinion. I couldn't face a UK winter without them.